Infiniti’s new Q50 will be priced from £27,950, it has been revealed. The performance saloon’s 2.2litre diesel SE kicks off the range, complete with a high standard specification including 17inch alloy wheels and run-flat tyres. LED lighting, front fog lights, heated door mirrors, scratch-shield paint and chrome-trimmed twin exhaust pipes are also included. On the inside, standard equipment features the likes of Infiniti’s new InTouch system, Bluetooth streaming, multifunction leather steering wheel and dual-zone adaptive climate control. Cruise control, speed limiter, stop start, hill start assist, rear view camera, rain-sensing wipers and keyless entry can also be enjoyed. A Premium grade takes the price to £30,350, and brings features such as leather heated seats and automatic dimming rear-view mirror. The £32,720 Sport grade adds a different bumper design, LED headlamps, LED daytime running lights and 19inch triple-spoke lightweight alloy wheels. It also benefits from a world first – Direct Adaptive Steering (DAS), which is ‘steer by wire’ technology only previously seen on jet planes. This technology provides the driver with the ability to adjust both the steering’s response and weight to suit personal preferences and type of driving. Active Lane Control is also included. 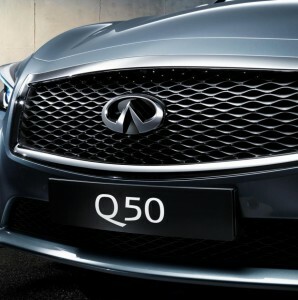 Meanwhile, the performance Hybrid Q50 is fitted with a 3.5litre V6 engine, capable of 0-62mph in 5.1seconds. Sports suspension, regenerative braking and sports brakes are all standard. Multimedia pack (£2760): Navigation system, Advanced Bose audio with 14 speakers and DAB radio with a roof mounted shark fin aerial. Welcome Pack (£1200): Tyre pressure monitoring with individual display, power and heated door mirrors with folding and reversing synchronisation, intelligent key with smart access and advanced features, welcome lighting, powered adjustment for rake and reach on the steering column, powered front seat adjustment with memory and powered lumbar support for the driver. Visibility pack (£1040): Adaptive front lighting, smart beam to help prevent high beam blindness to oncoming traffic and around view monitor for clear and safe parking. Steering Pack (£800): Direct Adaptive Steering and Active Lane control to give a more customised and precise feel to the steering whilst maintaining a more central path within a lane without the need for minor steering adjustments. Safety Shield Pack (£2080): Intelligent cruise control, lane departure warning and lane departure prevention, blind spot warning and blind spot intervention, forward emergency braking, predictive forward collision warning and automatics also get distance control assist and back up collision intervention.